This article is about four specific provisions of the Banking Act of 1933, which is also called the Glass–Steagall Act. For the earlier piece of economic legislation, see Glass–Steagall Act of 1932. The Glass–Steagall Act describes four provisions of the U.S. Banking Act of 1933 that limited securities, activities, and affiliations within commercial banks and securities firms. 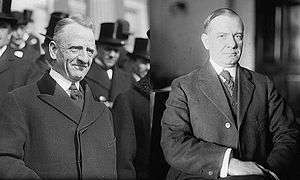 The Glass–Steagall Act also is used to refer to the entire Banking Act of 1933, after its Congressional sponsors, Senator Carter Glass (Democrat) of Virginia, and Representative Henry B. Steagall (D) of Alabama. This article deals with only the four provisions separating commercial and investment banking. The article 1933 Banking Act describes the entire law, including the legislative history of the Glass–Steagall provisions separating commercial and investment banking. A separate 1932 law also known as the Glass–Steagall Act is described in the article Glass–Steagall Act of 1932. Starting in the early 1960s, federal banking regulators interpreted provisions of the Glass–Steagall Act to permit commercial banks and especially commercial bank affiliates to engage in an expanding list and volume of securities activities. Congressional efforts to "repeal the Glass–Steagall Act", referring to those four provisions (and then usually to only the two provisions that restricted affiliations between commercial banks and securities firms), culminated in the 1999 Gramm–Leach–Bliley Act (GLBA), which repealed the two provisions restricting affiliations between banks and securities firms. By that time, many commentators argued Glass–Steagall was already "dead." Most notably, Citibank's 1998 affiliation with Salomon Smith Barney, one of the largest US securities firms, was permitted under the Federal Reserve Board's then existing interpretation of the Glass–Steagall Act. President Bill Clinton publicly declared "the Glass–Steagall law is no longer appropriate." Many commentators have stated that the GLBA's repeal of the affiliation restrictions of the Glass–Steagall Act was an important cause of the financial crisis of 2007–08. Economists at the Federal Reserve, such as Ben Bernanke, have argued that the activities linked to the financial crisis were not prohibited (or, in most cases, even regulated) by the Glass–Steagall Act. Sen. Carter Glass (D–Va.) and Rep. Henry B. Steagall (D–Ala.-3), the co-sponsors of the Glass–Steagall Act. The sponsors of both the Banking Act of 1933 and the Glass–Steagall Act of 1932 were southern Democrats: Senator Carter Glass of Virginia (who in 1932 had been in the House, Secretary of the Treasury, or in the Senate, for the preceding 30 years), and Representative Henry B. Steagall of Alabama (who had been in the House for the preceding 17 years). Between 1930 and 1932 Senator Carter Glass (D-VA) introduced several versions of a bill (known in each version as the Glass bill) to regulate or prohibit the combination of commercial and investment banking and to establish other reforms (except deposit insurance) similar to the final provisions of the 1933 Banking Act. On June 16, 1933, President Roosevelt signed the bill into law. Glass originally introduced his banking reform bill in January 1932. It received extensive critiques and comments from bankers, economists, and the Federal Reserve Board. It passed the Senate in February 1932, but the House adjourned before coming to a decision. The Senate passed a version of the Glass bill that would have required commercial banks to eliminate their securities affiliates. The final Glass–Steagall provisions contained in the 1933 Banking Act reduced from five years to one year the period in which commercial banks were required to eliminate such affiliations. Although the deposit insurance provisions of the 1933 Banking Act were very controversial, and drew veto threats from President Franklin Delano Roosevelt, President Roosevelt supported the Glass–Steagall provisions separating commercial and investment banking, and Representative Steagall included those provisions in his House bill that differed from Senator Glass's Senate bill primarily in its deposit insurance provisions. Steagall insisted on protecting small banks while Glass felt that small banks were the weakness to U.S. banking. Many accounts of the Act identify the Pecora Investigation as important in leading to the Act, particularly its Glass–Steagall provisions, becoming law. While supporters of the Glass–Steagall separation of commercial and investment banking cite the Pecora Investigation as supporting that separation, Glass–Steagall critics have argued that the evidence from the Pecora Investigation did not support the separation of commercial and investment banking. This source states that Senator Glass proposed many versions of his bill to Congress known as the Glass Bills in the two years prior to the Glass–Steagall Act being passed. It also includes how the deposit insurance provisions of the bill were very controversial at the time, which almost led to the rejection of the bill once again. The previous Glass Bills before the final revision all had similar goals and brought up the same objectives which were to separate commercial from investment banking, bring more banking activities under Federal Reserve supervision and to allow branch banking. In May 1933 Steagall's addition of allowing state chartered banks to receive federal deposit insurance and shortening the time in which banks needed to eliminate securities affiliates to one year was known as the driving force of what helped the Glass–Steagall act to be signed into law. Conversely, Glass–Steagall prevented securities firms and investment banks from taking deposits. The law gave banks one year after the law was passed on June 16, 1933 to decide whether they would be a commercial bank or an investment bank. Only 10 percent of a commercial bank's income could stem from securities. One exception to this rule was that commercial banks could underwrite government-issued bonds. There were several "loopholes" that regulators and financial firms were able to exploit during the lifetime of Glass–Steagall restrictions. Aside from the Section 21 prohibition on securities firms taking deposits, neither savings and loans nor state-chartered banks that did not belong to the Federal Reserve System were restricted by Glass–Steagall. Glass–Steagall also did not prevent securities firms from owning such institutions. S&Ls and securities firms took advantage of these loopholes starting in the 1960s to create products and affiliated companies that chipped away at commercial banks' deposit and lending businesses. While permitting affiliations between securities firms and companies other than Federal Reserve member banks, Glass–Steagall distinguished between what a Federal Reserve member bank could do directly and what an affiliate could do. Whereas a Federal Reserve member bank could not buy, sell, underwrite, or deal in any security except as specifically permitted by Section 16, such a bank could affiliate with a company so long as that company was not "engaged principally" in such activities. Starting in 1987, the Federal Reserve Board interpreted this to mean a member bank could affiliate with a securities firm so long as that firm was not "engaged principally" in securities activities prohibited for a bank by Section 16. By the time the GLBA repealed the Glass–Steagall affiliation restrictions, the Federal Reserve Board had interpreted this "loophole" in those restrictions to mean a banking company (Citigroup, as owner of Citibank) could acquire one of the world's largest securities firms (Salomon Smith Barney). By defining commercial banks as banks that take in deposits and make loans and investment banks as banks that underwrite and deal with securities the Glass–Steagall act explained the separation of banks by stating that commercial banks could not deal with securities and investment banks could not own commercial banks or have close connections with them. With the exception of commercial banks being allowed to underwrite government-issued bonds, commercial banks could only have ten percent of their income come from securities. The Glass–Steagall Legislation page specifies that only Federal Reserve member banks were affected by the provisions which according to secondary sources the act "applied direct prohibitions to the activities of certain commercial banks". It was not until 1933 that the separation of commercial bank and investment bank was considered controversial. There was a belief that the separation would lead to a healthier financial system. As time passed, however, the separation became so controversial that in 1935, Senator Glass himself attempted to "repeal" the prohibition on direct bank underwriting by permitting a limited amount of bank underwriting of corporate debt. In the 1960s the Office of the Comptroller of the Currency issued aggressive interpretations of Glass–Steagall to permit national banks to engage in certain securities activities. Although most of these interpretations were overturned by court decisions, by the late 1970s bank regulators began issuing Glass–Steagall interpretations that were upheld by courts and that permitted banks and their affiliates to engage in an increasing variety and amount of securities activities. Starting in the 1960s banks and non-banks developed financial products that blurred the distinction between banking and securities products, as they increasingly competed with each other. Separately, starting in the 1980s Congress debated bills to repeal Glass–Steagall's affiliation provisions (Sections 20 and 32). In 1999 Congress passed the Gramm–Leach–Bliley Act, also known as the Financial Services Modernization Act of 1999, to repeal them. Eight days later, President Bill Clinton signed it into law. After the financial crisis of 2007–08, some commentators argued that the repeal of Sections 20 and 32 had played an important role in leading to the housing bubble and financial crisis. Economics Nobel prize laureate Joseph Stiglitz, for instance, argued that "[w]hen repeal of Glass-Steagall brought investment and commercial banks together, the investment-bank culture came out on top," and banks which had previously been managed conservatively turned to riskier investments to increase their returns. Another laureate, Paul Krugman, contended that the repealing of the act "was indeed a mistake," however it was not the cause of the financial crisis. Other commentators believed that these banking changes had no effect, and the financial crisis would have happened the same way if the regulations had still been in force. Lawrence J. White, for instance, noted that "it was not [commercial banks'] investment banking activities, such as underwriting and dealing in securities, that did them in." At the time of the repeal, most commentators believed it would be harmless. Because the Federal Reserve's interpretations of the act had already weakened restrictions previously in place, commentators did not find much significance in the repeal, especially of sections 20 and 32. Instead, the five year anniversary of its repeal was marked by numerous sources explaining that the GLBA had not significantly changed the market structure of the banking and securities industries. More significant changes had occurred during the 1990s when commercial banking firms had gained a significant role in securities markets through "Section 20 affiliates." Following the financial crisis of 2007-08, legislators unsuccessfully tried to reinstate Glass–Steagall Sections 20 and 32 as part of the Dodd–Frank Wall Street Reform and Consumer Protection Act. Currently, bills are pending in United States Congress that would revise banking law regulation based on Glass–Steagall inspired principles. Both in the United States and elsewhere banking reforms have been proposed that also refer to Glass–Steagall principles. These proposals raise issues that were addressed during the long Glass–Steagall debate in the United States, including issues of “ring fencing” commercial banking operations and “narrow banking” proposals that would sharply reduce the permitted activities of commercial banks. 1 2 CRS 2010a, pp. 1 and 5. Wilmarth 1990, p. 1161. ↑ Wilmarth 2008, p. 560. ↑ Reinicke 1995, pp. 104-105. Greenspan 1987, pp. 3 and 15-22. FRB 1998. ↑ Macey 2000, p. 716. Wilmarth 2002, p. 219, fn. 5. ↑ Wilmarth 2002, pp. 220 and 222. Macey 2000, pp. 691-692 and 716-718. Lockner and Hansche 2000, p. 37. ↑ Simpson Thacher 1998, pp. 1-6. Lockner and Hansche 2000, p. 37. Macey 2000, p. 718. ↑ Kuttner, Robert (October 2, 2007), "The Alarming Parallels Between 1929 and 2007", The American Prospect: 2, retrieved February 20, 2012 . 1 2 Stiglitz, Joseph E. "Joseph E. Stiglitz on capitalist fools". Retrieved 2016-09-11. ↑ White, Lawrence J. (2010), "The Gramm-Leach-Bliley Act of 1999: A Bridge Too Far? Or Not Far Enough?" (PDF), Suffolk University Law Review, 43 (4): 938 and 943–946, retrieved February 20, 2012 . Markham, Jerry W. (2010), "The Subprime Crisis—A Test Match For The Bankers: Glass–Steagall vs. Gramm-Leach-Bliley" (PDF), University of Pennsylvania Journal of Business Law, 12 (4): 1092–1134, retrieved February 20, 2012 . ↑ "FRB: Speech--Bernanke, Monetary Policy and the Housing Bubble--January 3, 2010". www.federalreserve.gov. Retrieved 2016-09-11. 1 2 Mester, Loretta J. "Optimal industrial structure in banking." (2005). ↑ Kennedy 1973, pp. 50-53 and 203-204. Perkins 1971, pp. 497-505. ↑ Kennedy 1973, pp. 72-73. ↑ Patrick 1993, pp. 172-174. Kelly III 1985, p. 54, fn. 171. Perkins 1971, p. 524. ↑ Patrick 1993, pp. 168-172. Burns 1974, pp. 41-42 and 79. Kennedy 1973, pp. 212-219. ↑ Kennedy 1973, pp. 103-128 and 204-205. Burns 1974, p 78. ↑ Bentson 1990, pp. 47-89. Cleveland and Huertas 1985, pp. 172-187. ↑ "Banking Act of 1933, commonly called Glass-Steagall". ↑ "Financial Services Modernization Act of 1999, commonly called Gramm-Leach-Bliley". ↑ Krugman, Paul (2015-10-16). "Democrats, Republicans and Wall Street Tycoons". The New York Times. ISSN 0362-4331. Retrieved 2016-09-11. ↑ White, Lawrence J. (2010), "The Gramm-Leach-Bliley Act of 1999: A Bridge Too Far? Or Not Far Enough?" (PDF), Suffolk University Law Review, 43 (4): 938 and 943–946, retrieved February 20, 2012 . Barth, James R.; Brumbaugh Jr., R. Dan; Wilcox, James A. (2000), "The Repeal of Glass–Steagall and the Advent of Broad Banking" (PDF), Journal of Economic Perspectives, 14 (2): 191–204, doi:10.1257/jep.14.2.191, retrieved February 16, 2012 . Benston, George J. (1990), The Separation of Commercial and Investment Banking: The Glass–Steagall Act Revisited and Reconsidered, New York: Oxford University Press, ISBN 0-19-520830-7 . Burns, Helen M. (1974), The American Banking Community and New Deal Banking Reforms, 1933-1935, Westport, CT: Greenwood Press, ISBN 0-8371-6362-5 . Capatides, Michael G. (1992), A Guide to the Capital Markets Activities of Banks and Bank Holding Companies, New York: Bowne & Co., OCLC 28542600 . Carpenter, David H.; Murphy, M. Maureen (2010a), "Permissible Securities Activities of Commercial Banks Under the Glass–Steagall Act (GSA) and the Gramm-Leach-Bliley Act (GLBA)" (PDF), Congressional Research Service Report (R41181), retrieved February 10, 2012 . Carpenter, David H.; Murphy, M. Maureen (2010b), "The "Volcker Rule": Proposals to Limit "Speculative" Proprietary Trading by Banks" (PDF), Congressional Research Service Report (R41298), retrieved February 10, 2012 . Chapman and Cutler LLP (July 23, 2010), The Volcker Rule in the New Financial Regulation Law (Dodd-Frank Wall Street Reform and Consumer Protection Act of 2010) (PDF), retrieved February 19, 2012 . Cleveland, Harold van B.; Huertas, Thomas F. (1985), Citibank, 1812-1970, Cambridge, MA: Harvard University Press, ISBN 0-674-13175-4 . Covington & Burling (November 12, 1999), Financial Modernization: The Gramm-Leach-Bliley Act, Summary (PDF), American Bankers Association, retrieved February 24, 2012 . Eaton, David M. (1995), "The Commercial Banking-Related Activities of Investment Banks and Other Nonbanks", Emory Law Journal, 44 (3): 1187–1226 . Federal Deposit Insurance Corporation (1983), The First Fifty Years: A History of the FDIC 1933-1983, retrieved February 24, 2012 . Federal Reserve Bank of Philadelphia (1999), "Recent Developments: Financial Services Reform Enacted" (PDF), Banking Legislation & Policy, 18 (4): 1–4, retrieved February 24, 2012 . Federal Reserve Board (1987), "Orders Issued Under Section 4 of the Bank Holding Company Act, Citicorp, J.P. Morgan & Co., Incorporated, Bankers Trust New York Corporation" (PDF), Federal Reserve Bulletin, 73 (6): 473–508, retrieved October 16, 2014 . Federal Reserve Board (1998), Attachment I to Testimony of Chairman Alan Greenspan before the Committee on Banking, Housing, and Urban Affairs, U.S. Senate, June 17, 1998, Summaries of Prior Financial Modernization Legislation Considered and Passed by the Senate Banking Committee Since 1984, retrieved February 24, 2012 . Federal Reserve Board and U.S. Department of the Treasury (November 2003), Report to the Congress on Financial Holding Companies under the Gramm–Leach–Bliley Act (PDF), pp. 1–43, retrieved February 24, 2012 . Federal Reserve Board, "Bank Holding Company Supervision Manual: "Permissible Activities by Board Order (Section 4(c)(8) of the BHC Act),"" (PDF), 2011 update (July), retrieved February 24, 2012 . Felsenfeld, Carl; Glass, David L. (2011), Banking Regulation in the United States (3d ed. ), New York: Juris Publishing, Inc., ISBN 978-1-57823-263-5 . Fisher, Keith R. (2001), "Orphan of Invention: Why the Gramm-Leach-Bliley Act was unnecessary" (PDF), Oregon Law Review, 80 (4): 1301–1421, retrieved February 24, 2012 . Financial Crisis Inquiry Commission (2011), The Financial Crisis Inquiry Report, Final Report of the National Commission on the Causes of the Financial and Economic Crisis in the United States (PDF), retrieved February 24, 2012 . Focarelli, Dario; Marques-Ibanez, David; Pozzolo, Alberto Franco (January 2011), Are Universal Banks Better Underwriters? Evidence From the Last Days of the Glass–Steagall Act (PDF), ECB Working Paper Series (No. 1287), European Central Bank, pp. 1–34, retrieved February 25, 2012 . Friedman, Milton; Schwartz, Anna Jacobson, A Monetary History of the United States, 1867-1960, Princeton, N.J.: Princeton University Press, ISBN 0-691-00354-8 . Garten, Helen (1989), "Regulatory Growing Pains: A Perspective on Bank Regulation in a Deregulatory Age", Fordham Law Review, 57 (4): 501–577, retrieved February 24, 2012 . Garten, Helen (1991), Why Bank Regulation Failed : Designing a Bank Regulatory Strategy for the 1990s, New York: Quorum Books, ISBN 0-89930-580-6 . Garten, Helen (1993), "Universal Banking and Financial Stability", Brooklyn Journal of International Law, 19 (1): 159–195, retrieved February 25, 2012 . Garten, Helen (1999), "The Consumerization of Financial Regulation" (PDF), Washington University Law Quarterly, 77 (2): 287–318, retrieved February 24, 2012 . General Accounting Office (January 1988), "Bank Powers: Issues Related to the Repeal of the Glass–Steagall Act" (PDF), Report to the Honorable Edward J. Markey, Chairman, Subcommitteeon Telecommunications and Finance, Committee on Energy and Commerce,Houseof Representatives, GAO/GGD-88-37, pp. 1–75, retrieved February 24, 2012 . Greenspan, Alan (December 1, 1987), Testimony before the Committee on Banking, Housing, and Urban Affairs, U.S. Senate (PDF), retrieved October 16, 2014 . Greenspan, Alan (April 15, 2010), The Crisis (PDF), Washington, D.C.: The Brookings Institution, retrieved February 19, 2012 . Hendrickson, Jill M. (2001), "The Long and Bumpy Road to Glass–Steagall Reform: A Historical and Evolutionary Analysis of Banking Legislation" (PDF), American Journal of Economics and Sociology, 60 (4): 849–879, doi:10.1111/1536-7150.00126, retrieved February 24, 2012 . Heyward, Peter (2005), Citigroup to Congress: never mind! (some reflections on the Gramm-Leach-Bliley Act prompted by Citigroup’s exit from insurance underwriting) (PDF), Washington, D.C.: Venable LLP, retrieved February 16, 2012 . Independent Commission on Banking (September 2011), Final Report, Recommendations (PDF), pp. 1–354, retrieved February 24, 2012 . Jackson, William D. (2005), "Industrial Loan Companies/Banks and the Separation of Banking and Commerce: Legislative and Regulatory Perspectives" (PDF), Congressional Research Service Report (RL32767), retrieved February 11, 2012 . Jeannot, Jennifer Manville (1999), "An International Perspective on Domestic Banking Reform: Could the European Union's Second Banking Directive Revolutionize the Way the United States Regulates Its Own Financial Services Industry?" (PDF), American University International Law Review, 14 (6): 1716–1760, retrieved February 12, 2012 . Kavanaugh, Barbara; Boemio, Thomas R. & Edwards, Jr., Gerald A. (1992), "Asset-Backed Commercial Paper Programs" (PDF), Federal Reserve Bulletin, 78 (2): 107–116, retrieved October 16, 2014 . Kelly III, Edward J. (1985), "Chapter 2: Legislative History of the Glass–Steagall Act", in Walter, Ingo, Deregulating Wall Street: Commercial Bank Penetration of the Corporate Securities Market, New York: John Wiley & Sons, pp. 41–65, ISBN 0-471-81713-9 . Kennedy, Susan Estabrook (1973), 'The Banking Crisis of 1933, Lexington, KY: University Press of Kentucky, ISBN 0-8131-1285-0 . Kotlikoff, Laurence J. (2010), Jimmy Stewart is Dead: Ending the World’s Ongoing Financial Plaque with Limited Purpose Banking, John Wiley & Sons, Inc., ISBN 978-0-470-58155-1 . Kregel, Jan (2010a), "No Going Back: Why We Can Not Restore Glass–Steagall's Segregation of Banking and Finance" (PDF), Public Policy Brief No. 107, Levy Economics Institute of Bard College, pp. 1–17, retrieved February 11, 2012 . Kregel, Jan (2010b), "Can a return to Glass–Steagall provide financial stability in the US financial system", PSL Quarterly Review, 63 (252): 37–73, SSRN 1810803 . Kurucza, Robert M.; Ballen, Robert G.; McTaggert, Timothy R. (1988), "Securities and Investment Activities of Banks", The Business Lawyer, 43 (3): 1107–1121, retrieved February 25, 2012 . Langevoort, Daniel C. (1987), "Statutory Obsolescence and the Judicial Process: The Revisionist Role of the Courts in Federal Banking Regulation", Michigan Law Review, 85 (4): 672–733, doi:10.2307/1288728, retrieved February 12, 2012 . Levitt, Jr., Arthur (June 25, 1998), Prepared Testimony of the Honorable Arthur Levitt, Jr., Chairman, Securities and Exchange Commission, Senate Banking, Housing and Urban Affairs Committee, Hearing on H.R. 10-"The Financial Services Act of 1998", retrieved February 24, 2012 . Litan, Robert E.; Rauch, Jonathan (1998), American Finance for the 21st Century, Washington, D.C.: Brookings Institution Press, ISBN 0-8157-5288-1 . Macey, Jonathan R. (2000), "The Business of Banking: Before and After Gramm-Leach-Bliley", The Journal of Corporation Law, 25 (4): 691–722, retrieved February 25, 2012 . Malloy, Michael P. (2011), Banking Law and Regulation (2d ed. ), New York: Aspen Publishers, ISBN 978-1-4548-0107-8 . Markey, Edward J. (1990), "Why Congress Must Amend Glass–Steagall: Recent Trends in Breaching the Wall Separating Commercial and Investment Banking", New England Law Review, 25 (2): 457–475, retrieved February 25, 2012 . Mattingly, J. Virgil; Fallon, Keiran J. (1998), "Understanding the Issues Raised by Financial Modernization", North Carolina Banking Institute, 2: 25–69, retrieved February 25, 2012 . Mayer, Martin (1974), The Bankers, New York: Weybright and Talley, ISBN 0-679-40010-9 . Mayer, Martin (1984), 'The Money Bazaars, New York: E.P Dutton, ISBN 0-525-24221-X . Mayer, Martin (1997), The Bankers: The Next Generation, New York: Truman Talley Books, ISBN 0-525-93865-6 . New Rules Project (2012), The Glass Steagall Act and the Volcker Rule, Institute for Local Self-Reliance, retrieved February 9, 2012 . Omarova, Saule T. (2011), "From Gramm-Leach-Bliley to Dodd-Frank: The Unfulfilled Promise of Section 23A of the Federal Reserve Act" (PDF), North Carolina Law Review, 89 (5): 1683–1769, retrieved February 25, 2012 . Patrick, Sue C. (1993), Reform of the Federal Reserve System in the Early 1930s: The Politics of Money and Banking, New York: Garland Publishing, Inc., ISBN 0-8153-0970-8 . Peach, William Nelson (1941) [(reprint of the 1941 edition published by Johns Hopkins Press, Baltimore, MD, which was issued as ser. 58, no. 3 of Johns Hopkins University studies in historical and political science, originally presented as the author’s thesis, Johns Hopkins University, 1939)], The Security Affiliates of National Banks, New York: Arno Press Inc. (published 1975), ISBN 0-405-06984-7 . Perkins, Edwin J. (1971), "The Divorce of Commercial and Investment Banking: A History", Banking Law Journal, 88 (6): 483–528 . Pitt, Harvey L.; Williams, Julie L. (1983), "The Convergence of Commercial and Investment Banking: New Directions in the Financial Services Industry" (PDF), Journal of Comparative Business and Capital Market Law, 5 (2): 137–193, retrieved February 25, 2012 . Reinicke, Wolfgang H. (1995), Banking, Politics and Global Finance: American Commercial Banks and Regulatory Change, 1980-1990, Aldershot, England: Edward Elgar Publishing Limited, ISBN 1-85898-176-X . Rodelli, R. Nicholas (1998), "The New Operating Standards for Section 20 Subsidiaries: The Federal Reserve Board's Prudent March Towards Financial Services Modernization", North Carolina Banking Institute, 2: 311–344, retrieved February 14, 2012 . Rodkey, Robert G. (1934), "Banking Reform by Statute", Michigan Law Review, 32 (7): 881–908, JSTOR 1280817 . Shull, Bernard; White, Lawrence J. (May 1998), "Of Firewalls and Subsidiaries: The Right Stuff for Expanded Bank Activities" (PDF), Journal of Banking Law (forthcoming): 1–17, retrieved February 13, 2012 . Simpson Thacher & Bartlett LLP (September 30, 1998), Federal Reserve Approves Merger of Travelers and Citicorp (PDF), retrieved February 25, 2012 . Stern, Gary (2000), "Thoughts on Designing Credible Policies after Financial Modernization: Addressing too big to fail and moral hazard", The Region-The Federal Reserve Bank of Minneapolis (September): 2–4 and 24–29, retrieved February 25, 2012 . Stern, Gary J.; Feldman, Ron J. (2004), Too Big To Fail: The Hazards of Bank Bailouts, Washington, D.C.: Brookings Institution Press, ISBN 0-8157-8152-0 . Stiglitz, Joseph E. (January 2009), "Capitalist Fools" (PDF), Vanity Fair: 2, retrieved February 20, 2012 . United States Securities and Exchange Commission, Office of Legislative Affairs (June 24, 1994), Timeline of Bank Securities Activities (PDF), pp. 1–35, retrieved February 11, 2012 . United States Senate, Committee on Banking, Housing, and Urban Affairs (September 18, 1998), Report of the Committee on Banking, Housing, and Urban Affairs, United States Senate, to accompany H.R. 10, together with Additional Views (PDF), Government Printing Office, retrieved February 25, 2012 CS1 maint: Multiple names: authors list (link). United States Senate, Committee on Banking, Housing, and Urban Affairs (2004), Examination of the Gramm-Leach-Bliley Act Five Years after its Passage, Hearing before the Committee on Banking, Housing, and Urban Affairs, United States Senate, July 13, 2004 (PDF), Government Printing Office, retrieved February 25, 2012 CS1 maint: Multiple names: authors list (link). Vietor, Richard (1987), "Chapter 2: Regulation-Defined Financial Markets: Fragmentation and Integration in Financial Services", in Hayes, Jr., Samuel L., Wall Street and Regulation, Boston: Harvard Business School Press, pp. 7–62, ISBN 0-87584-183-X . Volcker, Paul A. (February 25, 1997), Statement before the Subcommittee on Financial Institutions and Consumer Credit, United States House of Representatives, The Committee on Financial Services, United States House of Representatives, retrieved February 25, 2012 . Volcker, Paul A. (May 14, 1997), Statement before the Committee on Banking and Financial Services, United States House of Representatives, The Committee on Financial Services, United States House of Representatives, retrieved February 25, 2012 . White, Eugene N. (1992), The Comptroller and the Transformation of American Banking, 1960-1990, Washington D.C.: Comptroller of the Currency, OCLC 27088818 . Whitehead, Charles K. (2011), "The Volcker Rule and Evolving Financial Markets" (PDF), Harvard Business Law Review, 1 (1): 39–73, retrieved February 19, 2012 . Willis, H. Parker (1935), "The Banking Act of 1933 in Operation", Columbia Law Review, 35 (5): 697–724, JSTOR 1115748 . Wilmarth, Jr., Arthur E. (1990), "The Expansion of State Bank Powers, the Federal Response, and the Case for Preserving the Dual Banking System", Fordham Law Review, 58 (6): 1133–1256, retrieved February 25, 2012 . Wilmarth, Jr., Arthur E. (1995), "Too Good to Be True - The Unfulfilled Promises behind Big Bank Mergers", Stanford Journal of Law, Business, and Finance, 2 (1): 1–88, retrieved February 25, 2012 . Wilmarth, Jr., Arthur E. (2001), "How Should We Respond to the Growing Risks of Financial Conglomerates", Public Law and Legal Theory Working Paper (034): 1–89, SSRN 291859 . Wilmarth, Jr., Arthur E. (2002), "The Transformation of the U.S. Financial Services Industry, 1975-2000: Competition, Consolidation and Increased Risks", University of Illinois Law Review, 2002 (2): 215–476, SSRN 315345 . Wilmarth, Jr., Arthur E. (2008), "Did Universal Banks Play a Significant Roe in the U.S. Economy's Boom-and-Bust Cycle of 1921-33? A Preliminary Assessment", Current Development in Monetary and Financial Law, 4, Washington, D.C.: International Monetary Fund, pp. 559–645, ISBN 978-1-58906-507-9, SSRN 838267 . Anderson, Benjamin (1949), Economics and the Public Welfare, New York: D. Van Nostrand Company . Barth, James R.; Brumbaugh, R. Dan, Jr. & Wilcox, James A. (2000), "Policy Watch: The Repeal of Glass–Steagall and the Advent of Broad Banking", Journal of Economic Perspectives, 14 (2): 191–204, doi:10.1257/jep.14.2.191, JSTOR 2647102 . Blass, Asher A.; Grossman, Richard S. (1998), "Who Needs Glass–Steagall? Evidence From Israel's Bank Share Crisis and the Great Depression", Contemporary Economic Policy, 16 (2): 185–196, doi:10.1111/j.1465-7287.1998.tb00511.x, retrieved February 27, 2012 . Burns, Arthur F. (1988), The Ongoing Revolution in American Banking, Washington, D.C.: American Enterprise Institute, ISBN 0-8447-3654-6 . Calomiris, Charles W.; White, Eugene N. (1994), "The Origins of Federal Deposit Insurance, chapter 5 in The Regulated Economy: A Historical Approach to Political Economy, edited by Claudia Golden and Gary D. Libecap, Chicago: University of Chicago Press, ISBN 0-226-30110-9" (PDF), Journal of Comparative Business and Capital Market Law, 5 (2): 137–193, retrieved February 27, 2012 . Canals, Jordi (1997), Universal Banking: International Comparisons and Theoretical Perspectives, Oxford; New York: Clarendon Press, ISBN 0-19-877506-7 . Coggins, Bruce (1998), Does Financial Deregulation Work? A Critique of Free Market Approaches, New Directions in Modern Economics, Northampton, MA: Edward Elgar Publishing Limited, ISBN 1-85898-638-9 . Firzli, M. Nicolas (January 2010), "Bank Regulation and Financial Orthodoxy: the Lessons from the Glass–Steagall Act", Revue Analyse Financière (in French): 49–52 . Hambley, Winthrop P. (September 1999), "The Great Debate-What will become of financial modernization", Community Investments, Federal Reserve Bank of San Francisco, 11 (2): 1–3, retrieved February 16, 2012 . Huertas, Thomas (1983), "Chapter 1: The Regulation of Financial Institutions: A Historical Perspective on Current Issues", in Benston, George J., Financial Services: The Changing Institutions and Government Policy, Englewood Cliffs, N.J.: Prentice-Hall, ISBN 0-13-316513-2 . Kroszner, Randall S. & Rajan, Raghuram G. (1994), "Is the Glass–Steagall Act Justified? A Study of the U.S. Experience with Universal Banking Before 1933", American Economic Review, 84 (4): 810–832, JSTOR 2118032 . Lewis, Toby (January 22, 2010), "New Glass–Steagall Will Shake Private Equity", Financial News . Mester, Loretta J. (1996), "Repealing Glass–Steagall: The Past Points the Way to the Future", Federal Reserve Bank of Philadelphia Business Review (July/August), retrieved February 25, 2012 . Minsky, Hyman (1982), Can It Happen Again?, Armonk, N.Y.: M.E. Sharpe, ISBN 0-873-32213-4 . Mishkin, Frederic S. (2006), "How Big a Problem is Too Big to Fail? A Review of Gary Stern and Ron Feldman's Too Big to Fail: The Hazards of Bank Bailouts" (PDF), Journal of Economic Literature, 44 (December): 988–1004, doi:10.1257/jel.44.4.988, retrieved February 25, 2012 . Pecora, Ferdinand (1939), "Wall Street Under Oath: The Story of Our Modern Money Changers", (reprint of 1939 edition pubslished by Simon &Schuster, New York ), Reprints of Economics Classics, New York: A.M. Kelley (published 1966), LCCN 68-20529 . Saunders, Anthony; Walter, Ingo (1994), Universal Banking in the United States: What could we gain? What could we lose?, New York: Oxford University Press, ISBN 0-19-508069-6 . Saunders, Anthony; Walter, Ingo, eds. (1997), Universal Banking: Financial System Design Reconsidered, Chicago: Irwin Professional Publishing, ISBN 0-7863-0466-9 . Uchitelle, Louis (February 16, 2010), "Elders of Wall St. Favor More Regulation", New York Times . White, Eugene Nelson (1986), "Before the Glass–Steagall Act: An analysis of the investment banking activities of national banks", Explorations in Economic History, 23 (1): 33–55, doi:10.1016/0014-4983(86)90018-5 . Willis, Henry Parker; Chapman, John (1934), The Banking Situation: American Post-War Problems and Developments, New York: Columbia University Press, OCLC 742920 . Wilmarth, Jr., Arthur E. (2007), "Walmart and the Separation of Banking and Commerce", Connecticut Law Review, 39 (4): 1539–1622, SSRN 984103 .